What if we all tossed our books, seminars, and top-ten lists on marriage and decided instead to expose our hearts, motivations, and worship to what scripture says about the topic? What if marriage was designed to make you holy and remind you of our personal relationship with God and transform the way we see all of our relationships? 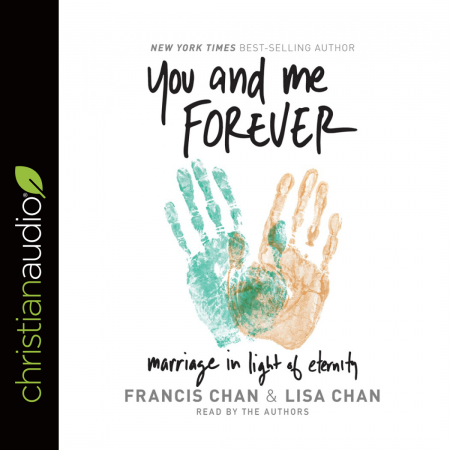 It used to be that the only resource I would recommend for couples regarding gospel-centered material was “When Sinners Say I Do” and now it appears that Connie and I have an additional resource, “You and Me Forever: Marriage in Light of Eternity” by Francis & Lisa Chan. Anything you can get your hands on by Francis Chan, you know is going to be good and to challenge you in your Christian daily walk. Because I heard the buzz before mainstream about it, I quickly purchased a copy. Connie and I had already listened to the audios by the time the solicitation came for an option to review for ChristianAudio. I had planned on writing a review and was further inspired with my email notification. This is a fantastic resource and the accompanying website is filled with valuable resources and tools that I would highly recommend to include a free .pdf version of the book. Eternal-mindedness keeps us from silly arguments. There’s no time to fight. We have better things to pursue than our interests. Too much is at stake! God created us for a purpose. We can’t afford to waste our lives. We can’t afford to waste our marriage by merely pursuing our own happiness...Christians in America have become experts at conviction--and failures at action...So today, do something. We all make mistakes. Err on the side of action. When two people are right with Him, they will be right with each other. As a pastor for over 20 years, I have come to the conclusion that most marriage problems are not really marriage problems. They are God problems. They can be traced back to one or both people having a poor relationship with God or a faulty understanding of Him. An accurate picture of God is vital to a healthy marriage. It’s vital to everything. Part of our role as Christians is to tell people about God’s story. All of us should be regularly telling people about who Jesus is and what He has done. This is necessary, and we must never be ashamed of Jesus (Matt. 10:32–33). But it’s one thing to preach the gospel and another thing to display the gospel. God and be able to say, “I prayed and studied this passage. I tried to ignore my personal desires and interpreted it as best I could. I believed this is what it said, so I did my best to live by it.” I also try to hold my views with humility, allowing God to convince me of a better interpretation at any point in the future through more study, prayer, and heart-examination. So many couples act like five-year-old soccer players when it comes to the spiritual war that we find ourselves in. God calls us to fight in an ongoing battle against darkness. In this battle, He has given us a clear mission—to make disciples. Yet Christian couples can most typically be found holding hands and skipping through life, ignoring the battle that rages around them. We have made happy families our mission. That is not the mission that Jesus gave us, but we try to justify this idolizing of marriage because it’s what we want. Practically speaking, we have to start with the seed of prayer. When is the last time you prayed specifically and earnestly for your marriage? How about specifically and earnestly for your husband or wife? Do you realize that very few people are going to be praying faithfully for your marriage and your spouse? I don’t want to sound dramatic, but prayer changes everything! Prayer opens up that line of communication with the Holy Spirit. There is no other way to invite the sensitivity you need to even hear the voice of the Lord. Yes, we must read and know Scripture, but without talking to God in prayer, we are crippled. Jesus went away from the crowds many times to speak to His Father alone. Who are we to think we can function without it? you have, they will have an authentic picture of what it means to live according to the Word rather than the world. God, help us love You deeply and fear You greatly. Teach us how to love each other for Your sake. May the humility of Christ be seen in the way we treat each other. Show us how to enjoy each other without neglecting Your mission. Remind us of the brevity of life so we share Your good news urgently. Remind us of heaven so we will face rejection and trials joyfully. When we settle down for too long, prod us to run. When we are prone to fight, teach us to fight together, and to fight for You. When we are tempted to run away, bring repentance and renewal. May we spend our married days reminding each other of Your glory, Your gospel, Your love, Your power, Your mission, and Your promise of what is to come. This audiobook was fantastic in that it was also ready by Francis & Lisa Chan, as I have mentioned before, nothing beats the author reading their own work. Further, although I did not quote all the scripture references, know that this work is SATURATED in scripture, in its entirety and without compromise. Connie and I zealously recommend this book to all, from all walks of life. It will change everything for those who have never heard, and revive those who have forgotten.